Foal Angular Limb Deformity What is it ? 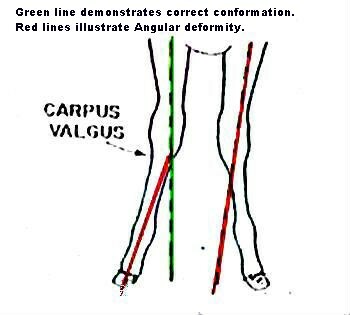 Angular limb deformities in the foal are defined as a deviation from normal alignment when viewed from the front. The deviation from normal may be in any of the joints or long bones of the legs. The deviation is seen as a lateral (outward or valgus) or medial (inward or varus) bowing of the limb usually at a joint. Deformity may involve the front and rear legs. Angular limb deformity may be caused by five predisposing defects. These are poor conformation, joint laxity, immature bones in the knee or hock, growth imbalance at the Goth line, and trauma to the growth plate. The result of these defects is uneven stress at the growth plate, resulting in an uneven growth rates in the stressed area. Once the cycle of uneven weight bearing begins, it continues as uneven growth on one side of the leg producing the angular deformity in the leg. Unless prompt veterinary treatment is sought, the uneven growth continues producing a deformity. Angular limb deformities may be present at the time of birth or may develop at any time prior to the closure of the growth plates. The deformities present at birth may result from abnormal position of the foal in the uterous. A foal 2-3 weeks prematurely may have the small bones of the joints not yet calcified and made up of mostly cartilage. Since the cartilage template of the bones in the knee and hock changes into bone during the last 2-3 weeks of gestation, the 2-3 week early foal does not have sufficient bone development for weight bearing yet and with joint laxity is predisposed to developing angular deformities. If the foal possesses an immature joint, the legs of the immature or joint laxity foal may be moved back into correct alignment by pushing against the leg with the leg then returning to the maligned position on release of the pressure. An abnormal growth rate of one side of the limb will result in a deviated leg which cannot be moved back into alignment with slight lateral or medial pressure. This abnormal growth in the growth plate may be from a number of causes. Note that all foals tend to be with a mild amount of angular deformity which corrects in the first few days after birth. Very rapid growth of the foal due to genetics or over nutrition may result in a weight too heavy for the young bones to bear at an early age and cause an early mild deviation to become a long term deformity. Common causes of growth plate trauma in foals are having the fetlock stepped on by the mare, or getting the fetlock caught in a hole or fence. If the injury causes crushing of the growth plate on one side and cessation of growth on that side, then the continuation of growth on the non-injured side causes deviation of the leg below that joint. Also pain in one leg causing increased weight bearing on the opposite leg may result in a deviation of the sound limb due to growth imbalance in the growth plate. Please note that most foals which develop angular deformities will respond to veterinary treatment if sought early. So do not wait to seek medical or surgical intervention from your veterinarian if you notice a foal developing "crooked legs". Delay may cause the time frame within which traetment is effective to be lost. The "rapid growth phase" is the time within which the corrections must take place to allow enough time for the straightening to take place in the deformed leg. Once the growth plates close, the bone growth stops and correction is no longer possible. Various bones have different times when the growth plates close, with some being within the first few weeks of life. !!!! The fetlocks are one of the joints which closes early, the "rapid growth phase is from 0 - 3 months of age. Surgery is best done within the first 4 weeks. Waiting longer may be too late to correct a severe deviation. Other joints close later so are not so urgent in seeking treatment, but timing of treatment is important to the success of treatment. So remember to consult your veterinarian early and be sure he is familiar with angular limb deformities. The most common deformities occur in the knees and are either called "knocked kneed" (valgus deviation) or "bow legged" (varus deviation". The ideal treatment time is 2 weeks to 4 months. 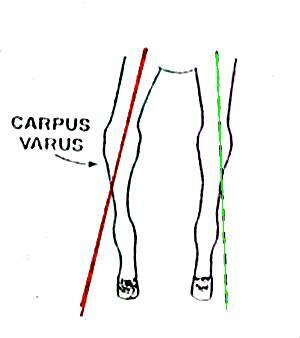 Second in occurence are fetlock deviations, either bowing inward (valgus) or outward (varus). 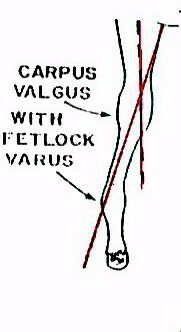 The hock is third in frequency and may be valgus or varus. These are somtimes referred to as "windswept foals" as they seem to be blown to the side as if by the wind. There are varied methods of treatment and depend on a proper diagnosis from a veterinarian experienced in foal orthopedic conditions. X-rays are used to pinpoint the site of abnormality and assist in deciding the course of treatment. Treatments may range from slowing a fast growth rate to orthopedic braces and surgery. Success is good in the majotity of cases recognised and treated early. The following illustrations will attempt to show some angular limb deformities.